NF-κB plays a critical role in the transcriptional regulation of proinflammatory gene expression in various cells. Cytokine-mediated activation of NF-κB requires activation of various kinases, which ultimately leads to the phosphorylation and degradation of IκB, the NF-κB cytoplasmic inhibitor. The food derivative curcumin has been shown to inhibit NF-κB activity in some cell types. In this report we investigate the mechanism of action of curcumin on cytokine-induced proinflammatory gene expression using intestinal epithelial cells (IEC). 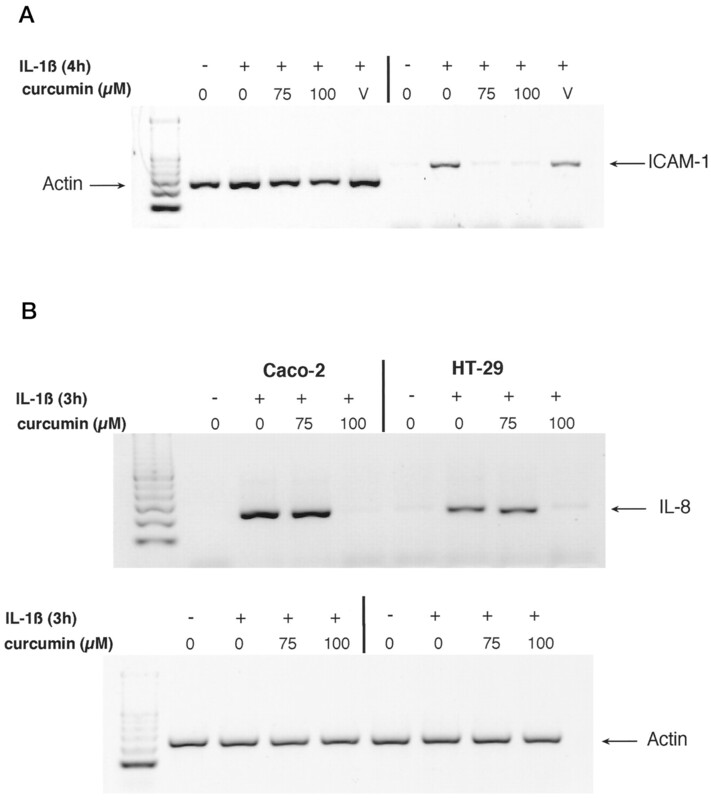 Curcumin inhibited IL-1β-mediated ICAM-1 and IL-8 gene expression in IEC-6, HT-29, and Caco-2 cells. Cytokine-induced NF-κB DNA binding activity, RelA nuclear translocation, IκBα degradation, IκB serine 32 phosphorylation, and IκB kinase (IKK) activity were blocked by curcumin treatment. 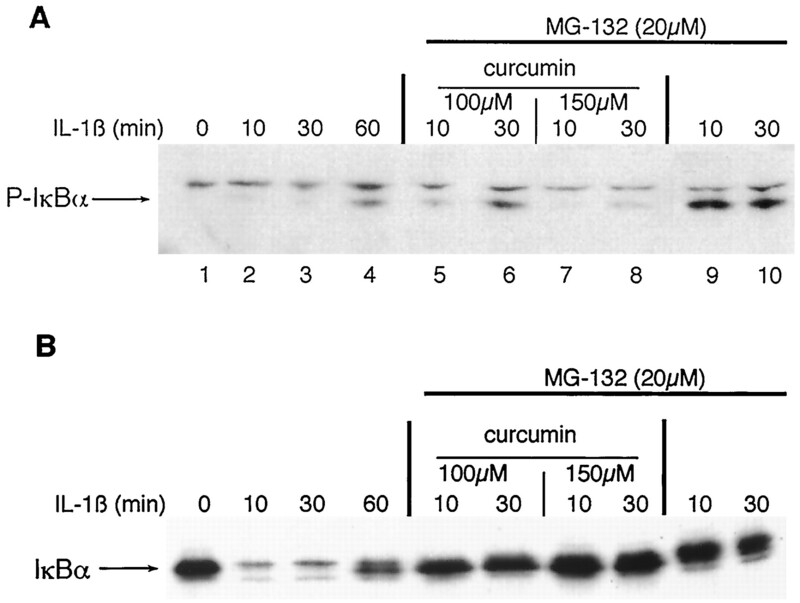 Wound-induced p38 phosphorylation was not inhibited by curcumin treatment. In addition, mitogen-activated protein kinase/ERK kinase kinase-1-induced IL-8 gene expression and 12-O-tetraphorbol 12-myristate 13-acetate-responsive element-driven luciferase expression were inhibited by curcumin. However, IκBα degradation induced by ectopically expressed NF-κB-inducing kinase or IKK was not inhibited by curcumin treatment. Therefore, curcumin blocks a signal upstream of NF-κB-inducing kinase and IKK. We conclude that curcumin potently inhibits cytokine-mediated NF-κB activation by blocking a signal leading to IKK activity. Many genes that are implicated in the initiation of immune, acute phase, and inflammatory responses are regulated at the level of transcription by NF-κB (1, 2). The NF-κB prototype in many cells is composed of the heterodimer RelA (p65) and NF-κB1 (p50) subunits. This heterodimer is the major NF-κB protein found in the nucleus of cytokine-stimulated intestinal epithelial cells (IEC)3 (3, 4) and is the most potent gene trans-activator among the NF-κB family (5, 6). NF-κB activation is tightly regulated by its endogenous inhibitor IκB, which complexes with and sequesters NF-κB in the cytoplasm. Following cytokine stimulation, IκBα is phosphorylated at serine residues 32 and 36, which initiates the selective ubiquination and rapid degradation of this inhibitor by the nonlysosomal, ATP-dependent 26S proteolytic complex composed of a 700-kDa proteasome (7, 8). IκBα phosphorylation involves the successive participation of various kinases linked to cytokine-specific membrane receptor complexes and adapter proteins, which converge on NF-κB-inducing kinase (NIK), a kinase dedicated to the NF-κB pathway (9, 10). Activated NIK then phosphorylates and activates the IκB kinase complex (IKK) (11, 12). IKK is part of a multiprotein complex that contains IKK-α and IKK-β subunits, both critical in mediating in vitro cytokine-induced IκB phosphorylation (13, 14, 15). Activation of the IKK complex leads to specific IκBα phosphorylation/degradation and subsequent release of NF-κB, which then translocates to the nucleus and activates transcription of multiple κB-dependent genes, including TNF-α, IL-6, IL-8, and other chemokines; MHC class II; ICAM-1; inducible nitric oxide synthase; and COX-2 (2). Since NF-κB plays a central role in mediating proinflammatory gene expression, there is growing interest in modulating its activity. Nontraditional or alternative medicine is becoming an increasingly attractive approach for the treatment of various inflammatory disorders among patients unresponsive to or unwilling to take standard medications. Among these alternative approaches is the use of food derivatives, which have the advantage of being relatively nontoxic. However, limited scientific evidence regarding the effectiveness of these natural derivatives in conjunction with a lack of mechanistic understanding of their actions has prevented their incorporation into the mainstream of medical care. Curcumin is the major constituent of turmeric powder extracted from the rhizomes of the plant Curcuma longa L found in south and southeast tropical Asia. Curcumin is used as a spice to give the specific flavor and yellow color to curry (16). In the countries of its origin, turmeric has also been used for centuries as a traditional medicine to treat inflammatory disorders (17, 18). Scientists have subsequently demonstrated the anti-inflammatory properties of curcumin (19). However, the mechanism of action for curcumin is not well understood. It was reported that curcumin inhibits TNF-α-induced NF-κB activation in human myelomonoblastic leukemia cells and phorbol ester-induced c-Jun/AP-1 activation in mouse fibroblast cells (20, 21). The molecular mechanism for NF-κB inhibition by curcumin was unclear, but involved inhibition of IκB degradation (20, 22, 23, 24). In this report we investigated the effect of curcumin on IEC gene expression and determined the molecular mechanism of curcumin action on the IκB/NF-κB signaling pathway. Our results demonstrate that curcumin blocks IEC gene expression by inhibiting the signal leading to IKK activation without directly interfering with NIK or IKK. Blockade of IKK activation causes inhibition of IκBα phosphorylation/degradation and NF-κB activation. Understanding the mechanisms of action of various anti-inflammatory food products could lead to the generation and acceptance of new improved therapies for inflammatory disorders. The rat nontransformed intestinal epithelial cell line IEC-6 (ATCC CRL 1592, American Type Culture Collection (ATCC), Manassas, VA) was used between passages 3 and 15, the human HT-29 colonic epithelial cells (ATCC HTB 38) were used between passages 10 and 25, and Caco-2 epithelial cells (ATCC HTB 37) were used between passages 29 and 40. Cells were grown as described previously (4, 25). Commercially available curcumin (98.7% pure; Narula Research, Chapel Hill, NC) was dissolved in 100% ethanol to a final concentration of 20 mM. Cells were pretreated for 45 min with various doses of curcumin (0–150 μM) or with ethanol vehicle (0.5%), after which they were stimulated with IL-1β or TNF-α (both at 2 ng/ml). In wounding experiments, cells were cultured in a six-well plate to confluence, were injured by six parallel scrapes across the well with the end of a pipette tip, and were returned to the incubator for 0, 3, 5, 7, and 10 min. The medium was then removed, and the cells were lysed in 1× Laemmli buffer. RNA was isolated using Trizol (Life Technologies, Grand Island, NY), reverse transcribed, and amplified as previously described (4, 25). The PCR products (5 μl) were subjected to electrophoresis on 2% agarose gels containing gel Star fluorescent dye (FMC, Philadelphia, PA). Fluorescence staining was captured using an AlphaImager 2000 (AlphaInnotech, San Leandro, CA). Negative controls included amplifications with no nucleic acid or no RT. The ICAM-1, IL-8, and actin primers have been described previously (4, 26). Curcumin-pretreated cells were stimulated with IL-1β (2 ng/ml) or TNF-α (2 ng/ml) for 0–60 min. The cells were lysed in 1× Laemmli buffer, and 20 μg of protein was subjected to electrophoresis on 10% SDS-polyacrylamide gels. Anti-phosphoserine IκBα (New England Biolabs, Beverly, MA), anti-IκBα Ab (Santa Cruz Biotechnology, Santa Cruz, CA), or antiphosphorylated p38 (New England Biolabs) was used to detect immunoreactive phosphorylated IκBα, total IκBα, or phosphorylated p38, respectively, using the enhanced chemiluminescence light-detecting kit (Amersham, Arlington Heights, IL) as described previously (3). Curcumin-pretreated cells were stimulated for 30 min with IL-1β (2 ng/ml), after which they were fixed with 100% ice-cold methanol. RelA immunofluorescence was performed as described previously (3). Briefly, cells were blocked with 10% nonimmune goat serum (NGS; Sigma, St. Louis, MO) for 30 min, then probed with rabbit anti-RelA (p65) Ab (Rockland, Gilberville, PA; diluted 1/200) in 10% NGS for 30 min, followed by rhodamine isothiocyanate-conjugated goat anti-rabbit IgG Ab (Jackson ImmunoResearch, West Grove, PA; diluted 1/100) in 10% NGS for 30 min. RelA was visualized with a fluorescent light microscope. Curcumin-pretreated cells were stimulated for 30 min with IL-1β (2 ng/ml), then nuclear extracts were prepared as described previously (3). Extracts (5 μg) were incubated with radiolabeled double-stranded class I MHC κB sites (GGCTGGGGATTCCCCATCT), separated by nondenaturing electrophoresis, and analyzed by autoradiography as described previously (3). For Ab supershifting analysis, nuclear extracts were preincubated with 1 μl of anti-RelA Ab directed against the C-terminus portion of this molecule (Rockland), 1 μl of anti-p50 Ab directed against the NLS portion of the molecule (SC-144X; Santa Cruz Biotechnology) or 1 μl of an irrelevant Ab (rabbit serum) for 15 min at room temperature before addition of the binding buffer and probe. For IκBα degradation assay, Caco-2 cells were transfected using lipofectamine reagent (Life Technologies) as described previously (3). 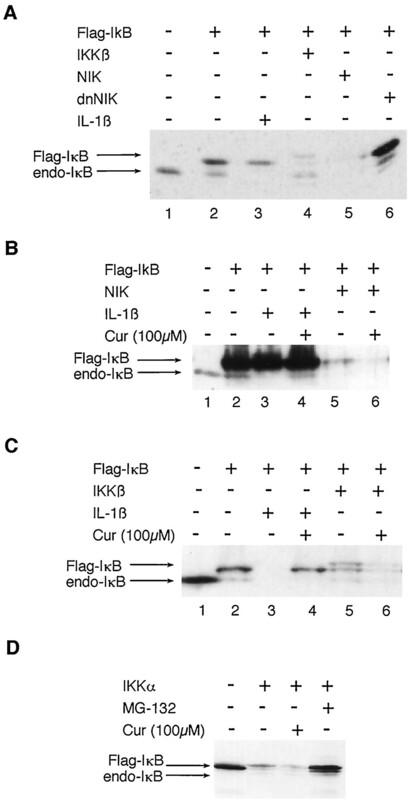 Plasmids expressing FLAG-tagged IκBα (1 μg), constitutively active IKK-β (2 μg; gift from Dr. A. S. Baldwin, University of North Carolina, Chapel Hill, NC), wild-type NIK (2 μg), or dominant negative NIK (dnNIK; 2 μg; gift from Dr. Massimo Levrero, Istituto I Clinica Medica, Rome, Italy) were transfected in combinations as described in Results. Empty vector was used to equalize total amount of DNA. For reporter gene assay, HT-29 cells were transfected with either an IL-8-luciferase reporter gene (IL-8-LUC; 1 μg) consisting of the native promoter (27) or a TPA-responsive element reporter gene (TRE-LUC; 1 μg) and cotransfected with mitogen-activated protein kinase/ERK kinase kinase-1 (MEKK-1) expression vector (0.5 μg). Transfected cells were incubated overnight, after which the DNA/lipofectamine medium was replaced with the serum-containing medium, and the cells were incubated for an additional 12 h in the presence or the absence of 100 μM curcumin or the proteasome inhibitor MG-132 (20 μM). For gene reporter assay, cells extracts were prepared using enhanced luciferase assay reagents (Analytical Luminescence, San Diego, CA). A luciferase assays was performed on a Monolight 2010 luminometer (Analytical Luminescence) for 20 s, and results were normalized for the extract protein concentration measured with the Bio-Rad protein assay kit (Bio-Rad, Hercules, CA). For IκBα degradation, a positive control for degradation was obtained by stimulating cells with IL-1β for 15 min, cells were lysed in 1× Laemmli buffer, and proteins were analyzed by Western blotting as described above. Caco-2 cells were plated (2 × 106 cells) in 100-mm dishes. At approximately 80% confluence, cells were pretreated with curcumin for 45 min, then stimulated with IL-1β (2 ng/ml) for 30 min. The cells were scraped, washed with ice-cold PBS, and then lysed in Triton buffer (28) containing protease and phosphatase inhibitors (4). Lysates were rotated at 4°C for 30 min, then cleared by centrifugation at 14,000 rpm, aliquoted, and stored at −80°C. Protein concentrations were determined using the Bradford protein assay. Eight hundred micrograms of whole cell extract was immunoprecipitated with an anti-human IKKα mAb (PharMingen, San Diego, CA) and protein A/G agarose (Santa Cruz Biotechnology) for 3 h at 4°C, then washed twice with Triton lysis buffer (28) and once with kinase reaction buffer (29). Immunoprecipitates were incubated at 30°C for 30 min in kinase reactions containing [γ-32P]ATP (ICN Biochemicals, Costa Mesa, CA) and recombinant substrate GST-IκBα (aa 1–54; 4 μg) or a mutated form of IκBα (S32T; S32T) immobilized on glutathione-agarose beads. Substrate protein was resolved by gel electrophoresis, and phosphate incorporation was assessed by autoradiography and PhosphorImager analysis (Molecular Dynamics, Sunnyvale, CA). An ELISA for human IL-8 was performed in triplicate using supernatants from curcumin-treated Caco-2 cells according to the manufacturer’s speci-fications (R&D Systems, Minneapolis, MN). The effects of curcumin on IEC gene expression and the IκB/NF-κB pathway were investigated using cells of rat and human origins. The rat nontransformed IEC-6 cell line was used because both IL-1β and TNF-α induce IκB degradation in this line, in contrast to other human IEC (3, 4, 25, 30). The transformed cells Caco-2 and HT-29 were also used to generalize this study. We first examined the effect of curcumin on IEC proinflammatory gene expression. IEC-6, Caco-2, and HT-29 cells were pretreated with various doses of curcumin for 30 min and then stimulated with IL-1β for 4 h, after which ICAM-1 and IL-8 mRNA accumulation was analyzed by RT-PCR. ICAM-1 mRNA accumulation was induced by IL-1β and was strongly decreased in cells treated with both 75 and 100 μM curcumin, whereas IL-8 mRNA was clearly inhibited by 100 μM curcumin pretreatment (Fig. 1⇓). Inhibition of IL-8 gene expression was confirmed by measuring IL-8 protein production using ELISA. IL-1β-mediated IL-8 secretion in Caco-2 cells was totally inhibited by pretreatment with 100 μM curcumin, and was also significantly reduced by 75 μM pretreatment (Fig. 2⇓). The discrepancy between mRNA and protein data at 75 μM probably reflects the nonquantitative nature of the RT-PCR technique. A similar inhibition of IL-1β-induced IL-8 gene expression by curcumin was obtained using the HT-29 cell line (data not shown). The inhibition of IL-8 gene expression did not result from a nonspecific global block of de novo protein synthesis or a decrease in cell viability, since curcumin doses ranging from 50–150 μM had no effect on overall [35S]methionine incorporation, whereas cycloheximide totally prevented protein synthesis (data not shown). These data demonstrate that curcumin efficiently blocked IL-1β-induced ICAM-1 and IL-8 gene expression in IEC. Inhibition of ICAM-1 (A) and IL-8 (B) gene expression by curcumin in IEC-6, Caco-2, and HT-29 cells as measured by RT-PCR. Cells were pretreated with curcumin (75 and 100 μM), vehicle (V; 0.5% ethanol), or medium alone for 45 min and then stimulated with IL-1β (2 ng/ml) or medium alone for 4 h. Total RNA was extracted, reverse transcribed, and amplified using specific ICAM-1 (A), IL-8 (B), or actin primers. PCR products were run on a 2% agarose gel and stained with gel Star. These results are representative of two different experiments. Caco-2 cells were pretreated with curcumin (75 and 100 μM) or medium alone for 45 min and then stimulated with IL-1β (2 ng/ml) or medium alone for 12 h. Immunoreactive IL-8 concentrations were measured from cell supernatants using an ELISA technique. These results are expressed as the mean ± SEM of triplicate experiments. These results are representative of two different experiments. NF-κB activation is essential for cytokine-mediated ICAM-1 and IL-8 gene expression in IEC (3, 4, 25, 26). Since NF-κB has been shown to be inhibited by curcumin in some cell types (20, 22, 23, 24), we next sought to determine whether the inhibitory effect of curcumin is mediated through the IκB/NF-κB system in IEC. IEC were pretreated with various doses of curcumin, then NF-κB activation was determined using EMSA and immunofluorescence localization. Nuclear extracts derived from curcumin-treated HT-29 cells revealed a decrease in IL-1β-stimulated NF-κB DNA binding activity compared with that in untreated cells (Fig. 3⇓A). As shown previously (31), p65/RelA is the major inducible NF-κB complex (Fig. 3⇓A, left panel) and is also the predominant subunit inhibited by curcumin. Fig. 3⇓B shows that RelA nuclear staining was increased in IL-1β-stimulated cells compared with the diffuse cytoplasmic staining found in unstimulated cells (compare panel 3 with panel 1). In accordance with the data presented in Fig. 3⇓A, curcumin inhibited NF-κB nuclear translocation as indicated by decreased RelA staining compared with that in untreated cells (compare panel 5 and panel 3). The p38 MAP kinase pathway is induced following IEC wounding (32). We next determined whether curcumin interferes with p38-inducible phosphorylation using the IEC wounding model. Caco-2 cells were cultured to confluence, pretreated with curcumin (100 μM) or medium alone, and then wounded for various time points. As shown in Fig. 4⇓, immunoreactive p38-phosphorylated protein was detected within 7 min following wounding in the medium control. Interestingly, curcumin treatment increased both basal and wound-induced p38 phosphorylation in Caco-2 cells, suggesting that this compound is not a general inhibitor of IEC signal transduction. Together, these results demonstrate that curcumin inhibits IL-1β-mediated NF-κB activation in IEC. Curcumin blockade of cytokine-induced NF-κB binding activity (A) and RelA (p65) subcellular translocation (B) in IL-1β-stimulated IEC. A, HT-29 cells were pretreated with curcumin (75 and 150 μM) or medium alone for 45 min and then stimulated with IL-1β (2 ng/ml) or left untreated for 30 min. Nuclear extracts (5 μg) were tested for κB binding activity by EMSA as described in Materials and Methods. NF-κB-specific complexes are indicated by arrows as determined by Ab supershifting (left panel). This EMSA is representative of three separate experiments. B, Caco-2 cells were pretreated with curcumin (100 μM) or medium alone for 45 min and then stimulated with IL-1β (2 ng/ml) or left untreated for 30 min. RelA localization was visualized using an anti-RelA primary Ab followed by a rhodamine-conjugated detection Ab as described in Materials and Methods. Nuclear DNA was stained using Hoechst dye. This immunofluorescence is representative of two separate experiments. Wound-induced p38 phosphorylation is not inhibited by curcumin in Caco-2 cells. Caco-2 cells were cultured to confluence, treated with curcumin (100 μM) or medium alone for 45 min, and then wounded for the indicated time points. Cells were directly lysed in Laemmli buffer, and 25 μg of protein was subjected to SDS-PAGE followed by immunoblotting of phospho-p38 using the enhanced chemiluminescence technique as described in Materials and Methods. Shown is a representative result of two independent experiments. MEKK-1 has been shown to activate both the c-Jun N-terminal kinase (JNK) and NF-κB pathways (33). We next sought to determine the effect and specificity of curcumin blockade on IEC signaling. HT-29 cells were transiently transfected with expression vectors encoding MEKK-1 and IL-8-luciferase (IL-8-LUC) or TPA-responsive element (TRE-LUC) reporter genes. Overexpression of MEKK-1 induced a 25-fold increase in IL-8-driven luciferase expressed compared with that in a control vector (Fig. 5⇓A). To assess the contribution of NF-κB to this induction, we employed the proteasome inhibitor MG-132, which specifically blocks NF-κB activation in IEC (3, 4). Treatment with 20 μM MG-132 abolished MEKK-1-induced IL-8-LUC expression, indicating that this expression is dependent on NF-κB activation (Fig. 5⇓A). As a control, we assessed MEKK-1 activation of TRE-LUC, an NF-κB independent promoter that is responsive to MEKK-1. As expected, MEKK-1 overexpression induced TRE-LUC expression, and this induction was unaffected by MG-132 (Fig. 5⇓B). Interestingly, both IL-8-LUC (Fig. 5⇓C) and TRE-LUC (Fig. 5⇓D) inductions by MEKK-1 were inhibited by curcumin. Of note, curcumin has been previously shown to inhibit JNK activity (24, 34), a downstream target of MEKK-1 on a divergent pathway from NF-κB activation. These results suggest that curcumin targets a common upstream kinase or multiple kinases induced by inflammatory signals. 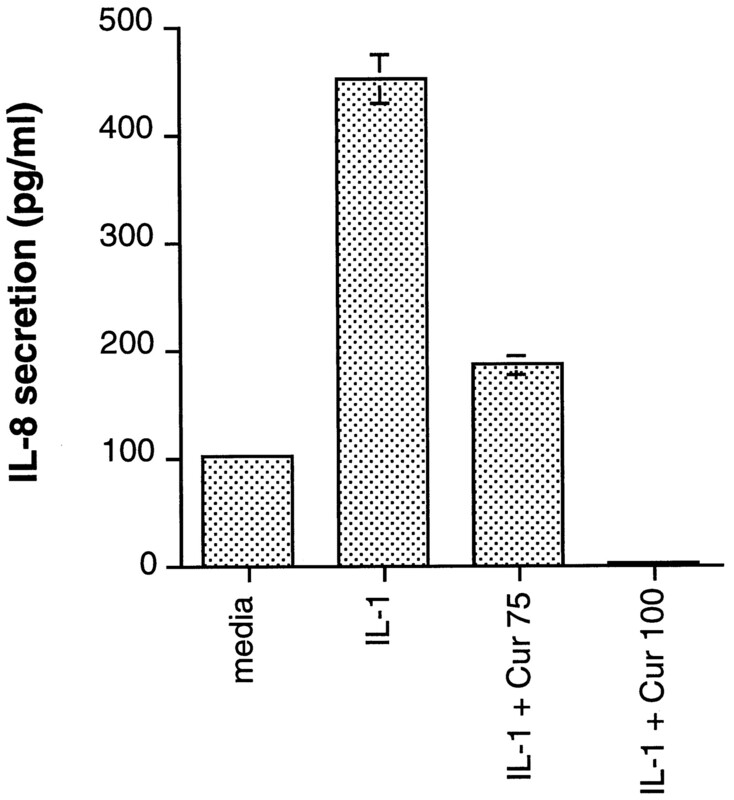 MEKK-1 induced IL-8-LUC is inhibited by curcumin in HT-29 cells. A, Cells were transfected with an IL-8-LUC reporter plasmid alone (1 μg) or were cotransfected with MEKK-1 expression vector (0.5 μg). Twenty-four hours post-transfection cells were incubated with fresh medium in presence or the absence of MG-132 (20 μM), and 12 h later cells extracts were prepared for determination of luciferase activity as described in Materials and Methods. Data are expressed as the fold induction compared with that of control cells. Results are presented as means from one representative experiment performed in triplicate. B, Cells were transfected with a TRE-LUC reporter plasmid alone (1 μg) or were cotransfected with MEKK-1 expression vector (0.5 μg), and 24 h post-transfection cells were incubated with fresh medium in the presence or the absence of MG-132 (20 μM). Cell extracts were prepared for determination of luciferase activity as described in Materials and Methods. Results are presented as means from one representative experiment performed in triplicate. C, Cells were cotransfected with an IL-8-LUC reporter plasmid (1 μg) and an MEKK-1 expression vector (0.5 μg) for 24 h post-transfection. Cells were then incubated with fresh medium in the presence or the absence of curcumin (100 μM), and 12 h later cell extracts were prepared for determination of luciferase activity as described in Materials and Methods. D, Cells were transfected with a TRE-LUC reporter plasmid alone (1 μg) or were cotransfected with MEKK-1 expression vector (0.5 μg) 24 h post-transfection. Cells were then incubated with fresh medium in the presence or the absence of curcumin (100 μM), and 12 h later cell extracts were prepared for determination of luciferase activity as described in Materials and Methods. Results are presented as means from one representative experiment performed in triplicate. Since NF-κB activity is controlled by the steady state level of IκB, we next investigated the effect of curcumin on cytokine-induced IκB degradation. Curcumin-pretreated IEC-6 cells were stimulated with either IL-1β or TNF-α for 0–60 min, then IκB protein levels were analyzed by Western blotting. As previously reported (4, 25), both cytokines induced rapid IκB degradation, which later recovered due to an autocrine regulatory loop (Fig. 6⇓A). TNF-α- and IL-1β-mediated IκB degradations were both blocked by curcumin pretreatment, indicating that curcumin is acting on a common component in the signaling pathways (Fig. 6⇓B). Curcumin blockade of IL-1β and TNF-α-induced IκBα degradation in IEC-6 cells. Cells were treated with medium alone (A) or were pretreated with curcumin (100 μM) for 45 min and then stimulated with IL-1β or TNF-α (both at 2 ng/ml) or medium alone for 0, 10, 30, and 60 min (B). Total protein was extracted, and 20 μg of protein was subjected to SDS-PAGE followed by immunoblotting of IκBα using the enhanced chemiluminescence technique as described in Materials and Methods. Shown is a representative result of three independent experiments. Phosphorylation of IκB on serines 32 and 36 is necessary for its degradation and consequent NF-κB activation (35, 36, 37, 38). Blockade of IκB degradation by curcumin could involve decreased IκB phosphorylation and/or inhibition of proteasome activity. To address these possibilities, IEC-6 cells were pretreated with curcumin and then stimulated with IL-1β for 0–60 min. Endogenous IκB phosphorylation was assessed using Western blotting with a specific IκB phosphoserine Ab. Phosphorylated IκB protein was detected after 10 min of IL-1β stimulation in cells pretreated with medium alone (Fig. 7⇓, lane 2), but was undetectable in nonstimulated cells (lane 1), showing that IL-1β induced specific serine 32 phosphorylation in IEC. A nonspecific band of approximately 47 kDa indicates that equal protein was loaded with each sample. Phosphorylated IκB disappeared at 30 min and reappeared at 60 min (lanes 3 and 4). The lack of phosphorylated IκB at 30 min indicates that the rate of degradation exceeded the rate of IκB phosphorylation at this time point, consistent with the extensive degradation of cytoplasmic IκBα shown in Fig. 6⇑A. Optimal doses of curcumin (100 μM) strongly inhibited the accumulation of phosphorylated IκB protein (Fig. 7⇓, lanes 8–10). Vehicle-treated cells (lanes 11–13) demonstrated a pattern of IκB phosphorylation similar to that with IL-1β treatment alone, showing no toxicity of ethanol vehicle. These results demonstrate that curcumin inhibits inducible IκBα serine phosphorylation. To carefully monitor the fate of phosphorylated IκB, proteasome activity was blocked with MG-132 to allow accumulation of the usually unstable phosphorylated IκB intermediates (3, 4). Caco-2 cells were pretreated with both curcumin and MG-132 for 45 min and then stimulated with IL-1β for 0–60 min. As opposed to IEC-6 cells, phosphorylated IκB was detected only after 60 min of IL-1β stimulation without the proteasome inhibitor (Fig. 8⇓A, lanes 1–4), suggesting that the rate of phosphorylated IκB degradation is faster in Caco-2 than in IEC-6 cells. MG-132 clearly stabilized phosphorylated IκB protein, which was detected at 10 and 30 min of IL-1β stimulation (compare lanes 2 and 3 with lanes 9 and 10). The accumulation of phosphorylated IκB protein by MG-132 pretreatment was reversed by curcumin in a dose-dependent manner (Fig. 8⇓A, compare lanes 5–8 with lanes 9 and 10). The same blot was then reprobed with an anti-IκBα Ab to evaluate the steady state levels of IκB. Fig. 8⇓B shows that IκBα was rapidly degraded in IL-1β-stimulated cells, and this degradation was inhibited by MG-132 as expected. Together, these data indicate that curcumin blocks the signal leading to IκB serine 32 phosphorylation and consequent IκB degradation. Curcumin blockade of IL-1β-induced IκBα serine 32 phosphorylation in IEC-6 cells. Cells were pretreated with curcumin (75 or 100 μM), vehicle (V; 0.5% ethanol), or medium alone for 45 min and then stimulated with IL-1β (2 ng/ml) or medium alone for 0, 10, 30, and 60 min. Total protein was extracted, and 20 μg of protein was subjected to SDS-PAGE followed by IκBα immunoblotting using a specific phosphoserine Ab as described in Materials and Methods. Curcumin blocks IκBα degradation by inhibiting IL-1β-induced serine 32 phosphorylation in Caco-2 cells. A, Cells were cotreated with curcumin (100 or 150 μM) and the proteasome inhibitor MG-132 (20 μM) or with medium alone for 45 min and then stimulated with IL-1β (2 ng/ml) or with medium alone for 0, 10, 30, and 60 min. Phosphoserine IκBα was detected as described in Fig. 7⇑. B, The same blot was probed for IκBα steady state as that described in Fig. 6⇑. Cytokine-inducible serine IκB phosphorylation is mediated by the IKK complex (8, 15). We next performed an IKK kinase assay to determine whether the decrease in serine 32 phosphorylation in curcumin-treated cells was due to reduced IKK activity or increased phosphatase activity. Caco-2 cells were pretreated with various doses of curcumin and then stimulated with IL-1β for 20 min. IKKα was immunoprecipitated, and its kinase activity was measured using GST-IκB (1, 2, 3, 4, 5, 6, 7, 8, 9, 10, 11, 12, 13, 14, 15, 16, 17, 18, 19, 20, 21, 22, 23, 24, 25, 26, 27, 28, 29, 30, 31, 32, 33, 34, 35, 36, 37, 38, 39, 40, 41, 42, 43, 44, 45, 46, 47, 48, 49, 50, 51, 52, 53, 54) as a substrate. Fig. 9⇓A shows that IL-1β induced an approximately 10-fold increase in IKK activity compared with unstimulated Caco-2 cells. The specificity of inducible IκB phosphorylation was demonstrated by the lack of phosphorylation of the mutated IκB substrate (S32T; S36T; Fig. 9⇓A). 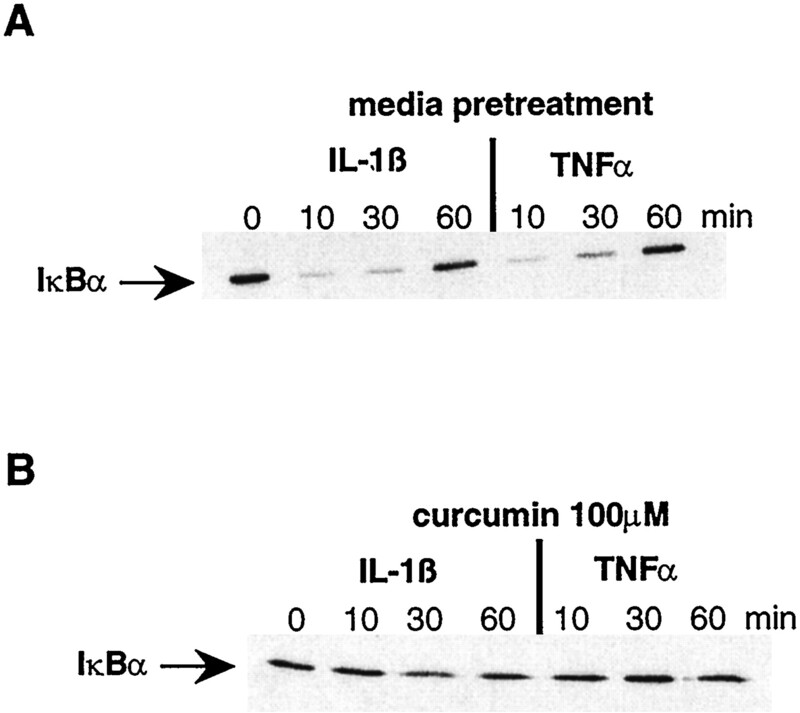 Curcumin pretreatment inhibited IL-1β-induced IKK activity in a dose-dependent manner (Fig. 9⇓B). 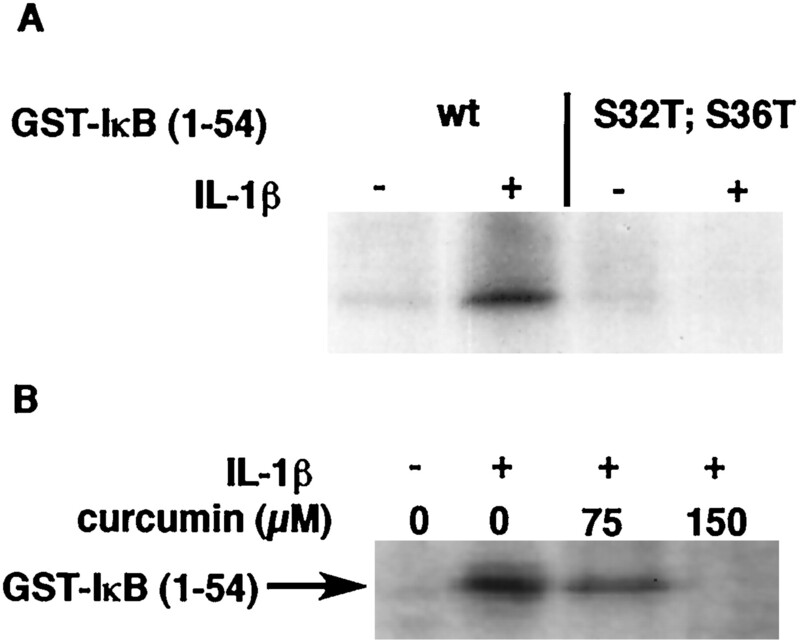 This result indicates that IL-1β-mediated IKK activity was inhibited by curcumin treatment. Curcumin inhibits IL-1β-induced IKK activity in Caco-2 cells. A, Cells were stimulated for 20 min with IL-1β (2 ng/ml) or medium alone. Cells were lysed and IKKα immunoprecipitated, and kinase activity was measured using a GST-IκB (wt; 4 μg) substrate or a mutated form of GST-IκBα (S32T; S36T) as described in Materials and Methods. Phosphorylated GST-IκBα was visualized after protein fractionation using 12.5% SDS-PAGE. Coomassie staining was used to document equal protein loading (not shown). B, Cells were pretreated with curcumin (75 and 150 μM) or with medium alone for 45 min and then stimulated with IL-1β (2 ng/ml) for 20 min. Cells were lysed, and IKK activity was measured as described above. Results are representative of two independent experiments. Cytokine-mediated IκB phosphorylation/degradation and NF-κB activation involve the activation of at least two sequential proximal kinases: NIK and IKK (7, 8, 39). To determine whether curcumin acts directly on NIK and/or on IKK, IκB degradation assays were performed in Caco-2 cells ectopically expressing NIK or IKKβ (Fig. 10⇓). A FLAG- IκB expression vector was transfected alone (lanes 2 and 3) or cotransfected with wild-type functional NIK (lane 5), dominant negative NIK (lane 6), or a constitutively active IKKβ (lane 4), then IκB steady state levels were analyzed by Western blotting. FLAG-IκB was used to determine the fate of both endogenous and exogenous IκB. 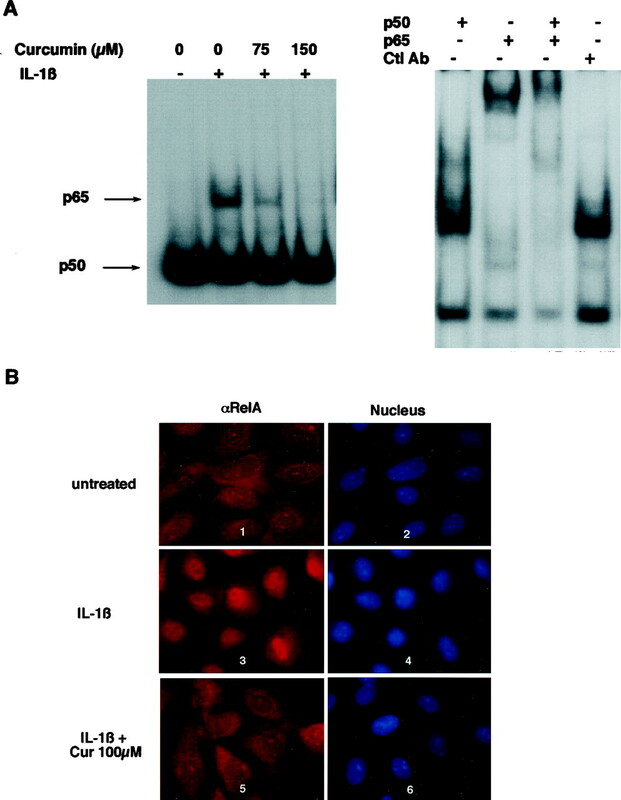 IL-1β stimulation of FLAG-IκBα-transfected cells triggered both the complete degradation of the endogenous IκB and the partial degradation of the overexpressed FLAG-IκB (Fig. 10⇓A, compare lanes 2 and 3). Ectopically expressed activated IKK or NIK induced both endogenous and exogenous IκB degradation (compare lanes 4 and 5 to lane 2), but dominant negative NIK (lane 6) had no effect on the steady state IκB level (lane 6), demonstrating the specificity of the assay. Curcumin does not directly inhibit NIK or IKK protein activity. Caco-2 cells were transfected with 1 μg of FLAG-IκBα alone or were cotransfected with 2 μg of either NIK or IKK as described in Materials and Methods, after which IκBα steady state was analyzed as described in Fig. 5⇑. A, Twelve hours post-transfection cells were stimulated with IL-1β (2 ng/ml) or medium alone for 15 min. B, Caco-2 cells were transfected with 1 μg of FLAG-IκBα alone or cotransfected with 2 μg of NIK as described in Materials and Methods. Twelve hours post-transfection cells were exposed to curcumin or medium alone for 12 h, then stimulated with IL-1β (2 ng/ml) or medium alone for 15 min. C, Caco-2 cells were transfected with 1 μg of FLAG- IκBα alone or were cotransfected with 2 μg of IKK as described in Materials and Methods. Twelve hours post-transfection cells were exposed to curcumin or medium alone for 12 h, then stimulated with IL-1β (2 ng/ml) or medium alone for 15 min. D, Caco-2 cells were transfected with 1 μg of FLAG- IκBα alone or cotransfected with 2 μg of IKK and 12 h post-transfection, cells were exposed to curcumin or MG-132 (20 μM) for 12 h.
We next investigated the effect of curcumin on these kinases. The FLAG-IκB expression vector was cotransfected with wild-type NIK (Fig. 10⇑B) or constitutively active IKKβ (Fig. 10⇑C). Twenty-four hours post-transfection Caco-2 cells were treated with curcumin, then IκB degradation was analyzed by Western blotting. Fig. 10⇑, B and C, shows that endogenous IκB was degraded following IL-1β stimulation (compare lanes 2 and 3) and that curcumin pretreatment prevented this degradation (compare lanes 4 and 3). Ectopically expressed NIK (Fig. 10⇑B) or IKK (Fig. 10⇑C) induced a strong degradation of both FLAG-IκB and endogenous IκB (compares lanes 5 and 2). Interestingly, although curcumin blocked IL-1β-stimulated IκBα degradation (lane 4), curcumin failed to prevent NIK- or IKK-mediated IκB degradation (Figs. 9⇑C and 10C, compare lanes 5 and 6). However, IκB degradation mediated by IKK (Fig. 10⇑D) or NIK (data not shown) was prevented in cells treated with the specific proteasome inhibitor MG-132. This indicates that the effect of ectopically expressed NIK or IKK on IκB degradation could be inhibited at the level of the proteasome as expected. These data demonstrate that curcumin does not directly inhibit NIK or IKK activity, but instead inhibits an upstream signal leading to IKK activation. In this study we analyzed the effect of curcumin on and its mechanism of action in regulating the IκB/NF-κB pathway in IEC. We report that curcumin pretreatment resulted in inhibition of cytokine-mediated NF-κB activation with concomitant down-regulation of ICAM-1 and IL-8 gene expression. The NF-κB blockade by curcumin involved inhibition of cytokine-mediated IκBα phosphorylation and degradation, and decreased IKK activity. Inhibition of IKK activity by curcumin was not mediated by direct interference with NIK or IKK activity, indicating that curcumin functions upstream of NIK activation. Furthermore, the inhibitory activities were not restricted to the NF-κB pathway, since the AP-1 pathway was also blocked. There is a strong rational for studying proinflammatory gene expression and the accompanying signaling pathways in IEC. IEC form a physical barrier that is the first line of defense against the aggressive gut milieu. These cells respond to many inflammatory stimuli, including bacteria and their products, and therefore play an important role in intestinal inflammation, since most of the genes induced in activated IECs have the potential to initiate and perpetuate inflammation (40). In addition to the growing in vitro evidence that supports a role for NF-κB in cytokine-mediated IEC gene expression in transformed and primary IEC (3, 4, 25, 26, 30, 31), recent data document NF-κB activation during intestinal inflammation. An elegant study performed by Rogler et al. demonstrated NF-κB activation in lamina propria mononuclear cells and in IEC derived from inflamed intestinal tissues (41). These data support the concept that NF-κB activation is an important step for IEC proinflammatory gene expression both in vivo and in vitro. Using pharmacological and molecular approaches, we have shown that proinflammatory gene expression in IEC could be inhibited by blockade at various points in the IκB/NF-κB pathway (3, 4, 25, 26, 30, 31). However, these approaches are not yet ready to be translated to the clinical setting. A method for the specific, efficient delivery of an adenoviral vector into the gut epithelium would be needed to initiate exogene expression. In addition, the use of gene therapy raises the concern of potential host immunological responses against viral vector proteins, permitting only short term exogene expression (42, 43). Alternatively, current proteasome inhibitors, although theoretically easier to administer and which have been proven to be effective in rodent models (44), are too toxic for prolonged utilization in human disease. The use of natural anti-inflammatory products provides an attractive and safe alternative to modulate inflammatory disorders. Curcumin is an anti-inflammatory food product that has been used for centuries in Asian cultures (19). However, the lack of information regarding a mechanism of action for curcumin combined with unknown effects on mucosal inflammatory gene expression have precluded the widespread clinical use of curcumin in western cultures for treatment of intestinal inflammatory disorders. Our data clearly indicate that cytokine-mediated expression of the adhesion molecule ICAM-1 and the chemokine IL-8 in IECs is blocked by curcumin treatment. The mechanism of action of curcumin involves blockade of IκB degradation, in agreement with previous studies using endothelial cells (22, 23, 24). We provide further evidence that curcumin inhibits IL-1β-induced serine 32 phosphorylation of IκB by interfering with IKK activation. To further define the mechanism by which IKK activity is inhibited by curcumin, we employed a degradation assay using the two key NF-κB pathway kinases, NIK and IKK. Ectopic expression of NIK or IKK allowed us to bypass cytokine receptors, which trigger the induction of a variety of secondary messengers, and specifically address the effect of curcumin on more proximal NF-κB-inducing signals. Using this approach, we found that curcumin does not directly interfere with NIK or IKK activity, since IκBα was still degraded. However, when either IL-1β or TNF-α cell surface receptors were stimulated, curcumin inhibited signals, leading to IκB degradation. This indicates that curcumin acts at a level upstream of or parallel to NIK activation, yet inhibits two separate cytokine receptor signal transduction pathways that converge on NIK. However, we cannot rule out the possibility that ectopic expression of NIK or IKK overwhelms the capacity of curcumin to block IKK activity in IEC. Arguing against this possibility are our findings that the proteasome inhibitor MG-132 was effective in completely blocking IKK-mediated IκBα degradation and also that a relatively low dose of curcumin (75 μM) was effective in inhibiting endogenous NF-κB activation and proinflammatory gene expression. The cytokine-induced IκB/NF-κB signaling cascade is complex, involving the participation of multiple kinases and adapter proteins (see Fig. 11⇓). Following TNF-α stimulation, TNF receptor-associated factor 2 (TRAF-2) and the receptor-interacting protein (RIP) are recruited and associate to the cytoplasmic portion of the TNF receptor-1 via the scaffolding function of TNF receptor-1 receptor-associated death domain (45, 46). As opposed to TNF-α, IL-1β uses the IL-1R accessory protein and the IL-1R-associated kinase, which associates with and transmits the signal to TRAF-6 (47, 48). The TNF-α and IL-1β pathways converge on NIK, which then activates the IKK protein complex (11, 12). NIK associates with TRAF-2 and TRAF-6 following TNF-α and IL-1β stimulation, respectively, and is thought to be a cytokine-integrating signal for NF-κB activation (9, 10). It should be mentioned that TRAF-2-mediated NF-κB activation is the subject of controversy (31, 49, 50, 51). However, we have shown that TRAF-2 has a partial role in both IL-1β- and TNF-α-induced NF-κB-mediated IL-8 gene expression in IEC (31). Since curcumin blocks both IL-1β- and TNF-α-induced IκB degradation, it seems reasonable to assume that curcumin targets common messengers used by these cytokines. 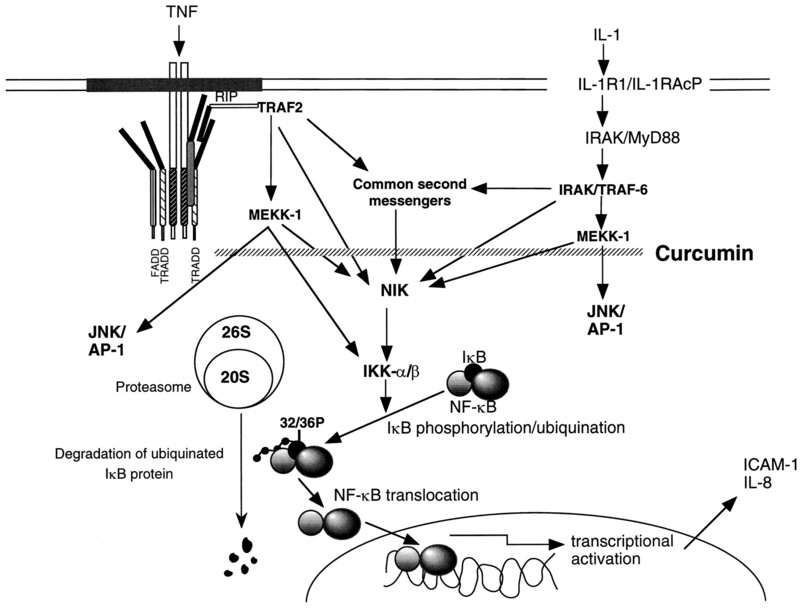 This effect of curcumin could be due to interference with signal-transmitting adapter proteins such as RIP, TRAF-2, or TRAF-6, leading to MEKK, NIK, or IKK activation (Fig. 11⇓). Another possibility is that curcumin inhibits the action of a second messenger induced by both IL-1β and TNF-α that is capable of NIK and/or IKK activation. The rapid onset of action (45 min) argues against the induction of an inhibitory protein. Of note, curcumin possesses antioxidative properties and functions as a free radical scavenger (19, 52). Reactive oxygen species (ROS) have been postulated to regulate NF-κB activity in certain cell types by modulating, rather than initiating, NF-κB activation (53). However, a role for ROS in cytokine-mediated NF-κB activation is not universally accepted and is the subject of controversy (54). We were unable to detect ROS production in cytokine-stimulated HT-29 cells as measured by cytochrome c reduction (C. Jobin and S. S. Mukarov, unpublished observations). This is in agreement with a previous report showing a lack of detectable ROS in cytokine-stimulated IEC (55). Therefore, it seem unlikely that curcumin blocks NIK or IKK activity through inhibiting cytokine-induced ROS production or activity. Nevertheless, curcumin inhibits the signal going to the IKK complex by interfering with a signal upstream from NIK. This is in contrast to the recent description of blockade of IKKβ activity by aspirin, which is a purified derivative of an age-old folk remedy (56). Hypothetical mechanism of action of curcumin on cytokine-induced NF-κB activation. Curcumin blocks a signal upstream of NIK but below the junction of TNF-α and IL-1β signal pathways. The curcumin blockade could be mediated by inhibition of a cytokine-induced common second messenger responsible for NIK activation and/or by inhibition of TRAF/RIP-transmitting signals from both the TNF-α and IL-1β pathways. The mitogen-activated protein 3-kinase family members MEKK-1 and NIK have been reported to independently activate the IKK complex (33). An intriguing finding from our data is that MEKK-induced, but not NIK-induced, signaling was inhibited by curcumin treatment in IEC. This suggests that MEKK acts upstream from and not parallel to NIK in NF-κB activation in IEC, or that curcumin independently blocks separate signal pathway. Further studies will be needed to precisely position MEKK in the NF-κB pathway. The finding that curcumin also inhibits MEKK-1 targets other than NF-κB, such as theTRE, which is activated by the JNK pathway, suggests that this compound is not a specific inhibitor of the NF-κB pathway. In agreement with this observation is the report on inhibitory effect of curcumin on JNK activity, a downstream target of MEKK-1 (34). However, curcumin is not a general metabolic inhibitor of IEC, since de novo protein synthesis and wound-induced p38 phosphorylation were not inhibited. Development of new drugs that inhibit NF-κB activation at various points of the signal transduction pathway will require pharmacokinetic and toxicity studies in conjunction with clinical verification of in vivo activity. The food additive curcumin has the advantage of being a nontoxic natural product (52). The pharmacological safety of curcumin is shown by the nontoxic consumption of up to 100 mg/day in humans and up to 5g/day in rats (19, 52). In addition, curcumin is nonmutagenic (52, 57). However, the bioavailability of curcumin in vivo is low after oral ingestion (19), but can be dramatically elevated by coingestion of piperine in both rats and humans (58). Nevertheless, the highest concentration of curcumin, regardless of piperine use, is found in the cecum after oral ingestion (19), a common site of intestinal inflammation. Additionally, luminal curcumin may have a topical activity on colonic epithelial cells independent of systemic absorption. Therefore, the concentrations used in our in vitro study could be easily achieved in vivo in the intestinal mucosa in both rats and humans, making our results highly relevant for in vivo use. Together, these data provide strong evidence that curcumin blocks IEC gene expression by inhibiting the signal leading to IKK activation, subsequent IκBα phosphorylation/degradation, and NF-κB activation. This study provides a strong rational to investigate the effect of curcumin in an in vivo experimental model of intestinal inflammation. We thank Julie Vorobiov from the Immunoassay Core of the Center for Gastroenterology Biology and Disease for expert assistance with IL-8 quantification. We thank Drs. S. S. Makarov and A. J. G. Schottelius for helpful comments. 1 This work was supported by a Career Development Award from the Crohn’s and Colitis Foundation of America (to C.J. ), National Institutes of Health Grant ROI-DK47700 (to R.B.S. ), and National Institutes of Health Center Grant DK34087. 3 Abbreviations used in this paper: IEC, intestinal epithelial cells; IKK, IκB kinase; NIK, NF-κB-inducing kinase; NGS, nonimmune goat serum; TPA, 12-O-tetraphorbol 12-myristate 13-acetate; MEKK-1, mitogen-activated protein kinase/ERK kinase kinase-1; TRE, TPA-responsive element; LUC, luciferase; JNK, c-Jun N-terminal kinase; TRAF-2, TNF receptor-associated factor-2; RIP, receptor-interacting protein; ROS, reactive oxygen species. Nadkarni, K. M. 1976. Curcuma Long. Popular Prskashan Publishing Co., Bombay. Chopra, R. N., I. C. Chopra, K. L. Handa, and L. D. Kapur. 1958. Indigenous drugs of India. In Dhur, 2nd Ed. pp. 325.